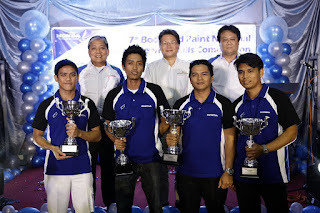 Honda Cars Philippines, Inc. (HCPI) takes pride in conducting the 7th Body and Paint National Customer Service Skills Competition (NCSSC) to showcase the skills of their dealer service associates in four (4) categories – Body Repair, Paint Repair, Paintless Dent Repair, and Service Advisor. The NCSSC for Body and Paint was first conducted in 2002, and is being held once every two years. In this year’s competition, sixty-four (64) in-house Honda technicians from twenty-two (22) dealerships nationwide were gathered together last month to test their skills following Honda’s standard welding process, paint repair process, and service advisor skills. With this year’s theme, “Driven by Quality Service, Going Beyond Customer Satisfaction”, HCPI proudly highlighted the contestants’ exemplary skills and knowledge in Honda’s after-sales service. The NCSSC allowed contestants to promote standard Body & Paint Repair Processes using appropriate tools and equipment that aided in delivering finished products with efficiency and superior quality. Through the competition, the contestants were also able to exhibit their skills in providing customer needs beyond satisfaction. The competition consisted of technical and theoretical challenges that tested the knowledge and skills of the participants in real-world situations, not only in Paint & Body Repair, but also in terms of teamwork and communication. After a series of timed written and practical examinations, the contestants have proven their expert familiarity in the after-sales field. The competition indeed served as a platform for Honda service associates to present global Honda skills and standards in a competitive environment. As Honda aims to improve and expand its after-sales service, it continuously conducts training programs and activities for its dealer associates to ensure excellence in their body and paint repair service.